The relationship between renal salt handling and hypertension is intertwined historically. The discovery of WNK kinases (With No lysine = K) now offers new insight to this relationship because WNKs are a crucial molecular pathway connecting hormones such as angiotensin II and aldosterone to renal sodium and potassium transport. To fulfill this task, the WNKs also interact with other important kinases, including serum and glucocorticoid-regulated kinase 1, STE20/SPS1-related, proline alanine-rich kinase, and oxidative stress responsive protein type 1. Collectively, this kinase network regulates the activity of the major sodium and potassium transporters in the distal nephron, including thiazide-sensitive Na-Cl cotransporters and ROMK channels. Here we show how the WNKs modulate ion transport through two distinct regulatory pathways, trafficking and phosphorylation, and discuss the physiologic and clinical relevance of the WNKs in the kidney. This ranges from rare mutations in WNKs causing familial hyperkalemic hypertension to acquired forms of hypertension caused by salt sensitivity or diabetes mellitus. Although many questions remain unanswered, the WNKs hold promise for unraveling the link between salt and hypertension, potentially leading to more effective interventions to prevent cardiorenal damage. In the last 10 years, a number of previously unrecognized kinases interacting in the distal nephron have been identified as playing important roles in sodium, potassium, and BP regulation. Among these are the WNKs (with no lysine = K), serine threonine kinases, which are atypical because the catalytic lysine crucial for binding to ATP is located in subdomain I instead of II. The WNK kinases were identified while searching for novel members of the mitogen-activated protein kinase family.1 The finding that mutations in WNK kinases cause the monogenetic disorder, familial hyperkalemic hypertension (FHHt, also known as pseudohypoaldosteronism type II or Gordon syndrome),2 sparked further interest in these regulatory proteins.3 Subsequent studies implicate WNK kinases in the direct or indirect regulation of the major sodium and potassium transporters in the distal nephron and in the pathogenesis of hypertension. Based on the disease phenotype resulting from WNK kinase mutations, it is clear that WNKs play important roles in regulating ion channels and transporters. 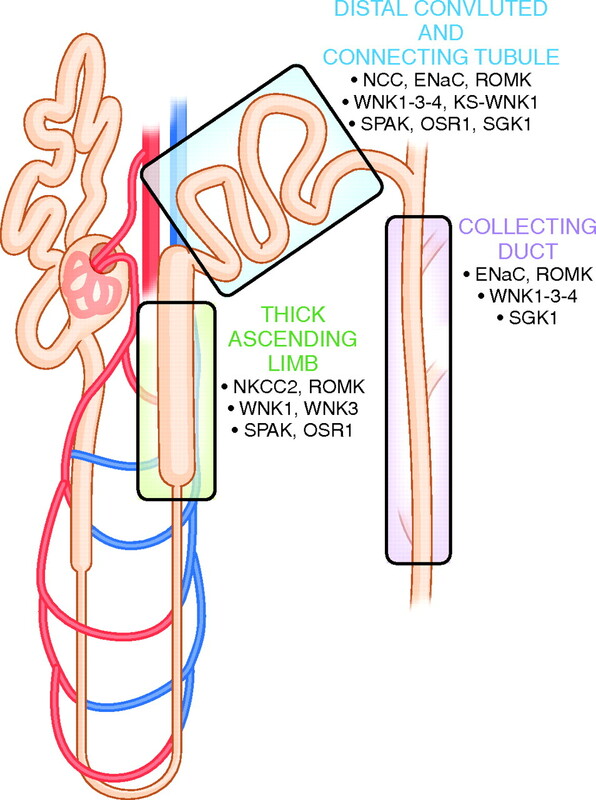 There is now abundant evidence, both in vitro and in vivo, that WNK kinases regulate the renal outer medullary potassium channel (ROMK),4 the sodium potassium chloride cotransporter type 2 (NKCC2),5 the sodium chloride cotransporter (NCC),6 and the epithelial sodium channel (ENaC) (Figure 1).7 WNK kinases modulate many other transport proteins as well.8. Expression of major sodium and potassium transport proteins in the distal nephron, including WNK kinases and associated regulatory proteins. See text for abbreviations. Model of NCC regulation by WNK kinases. NCC is trafficked as a monomer from the cytosol to the apical plasma membrane to become an inactive dimer (lower half of figure). Activation of the NCC dimer is achieved by phosphorylation through SPAK, stimulating NaCl transport (left). This process is regulated by WNK kinases. WNK4 (green symbol) inhibits the trafficking step of NCC by diverting it to the lysosome, a process that is mediated by sortilin and adaptin 3 (AP3). Conversely, WNK3 (red symbol) stimulates trafficking. WNK3 and WNK4 inhibit each other's activities. WNK4 is inhibited by WNK1 (red symbol), which in turn is inhibited by KS-WNK1 (blue and red symbol). WNK1 and WNK3 are also thought to influence the activity of SPAK, thereby controlling the phosphorylation and thus activation step of NCC. At present, it is unknown how the endocytic retrieval of NCC is regulated (question mark symbol). See text for details and abbreviations. Besides trafficking, NCC is regulated by phosphorylation. A number of recent studies showed that both plasma membrane abundance and phosphorylation of NCC are increased by aldosterone,30–32 angiotensin II,30,32,33 and, surprisingly, vasopressin.34,35 SGK1, WNKs, and/or SPAK are identified as the main intracellular mediators of these receptor–transporter cascades.30–33,35 Although phosphorylation and trafficking can be dissociated in vitro, it remains to be determined whether trafficking and phosphorylation can occur independently in vivo and what their relative contributions are in the regulation of NCC. NKCC2, the major sodium transporter in the TAL, is an interesting example of how trafficking and phosphorylation act in concert to regulate transporter activity. Using Xenopus oocytes, Giménez and Forbush36 showed that, under isotonic and hypotonic conditions, NKCC2 retained 50% of its activity in the absence of phosphorylation of three important threonines (99, 104, 117 in the rabbit sequence). Phosphorylation of these three residues, however, was necessary to stimulate NKCC2 activity during hypertonicity. Also in oocytes, Ponce-Coria et al.18 found that the activation of NKCC2 by low intracellular chloride also required phosphorylation of the three highly conserved threonines. 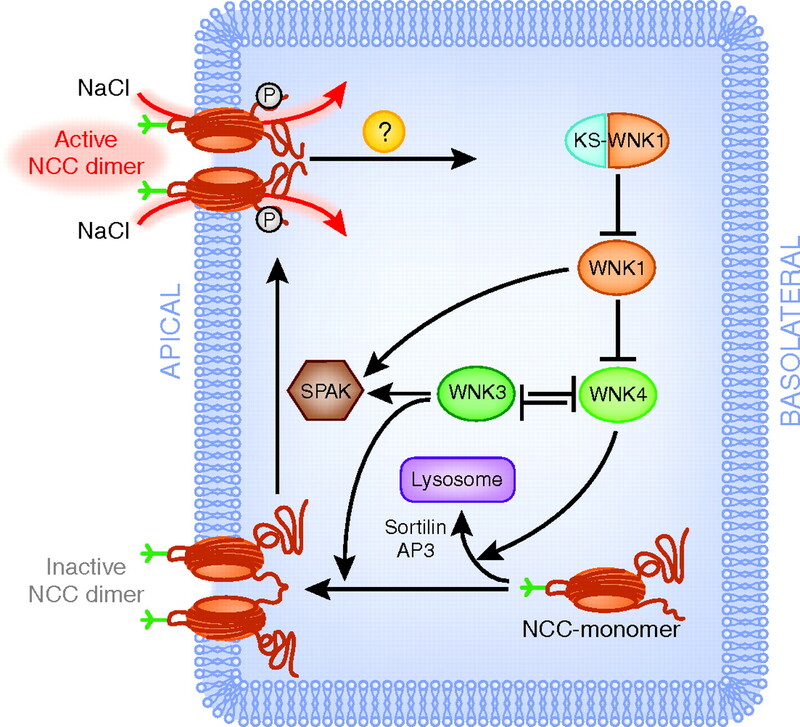 In addition, they found that phosphorylation of NKCC2 also requires an interaction between WKN3 and SPAK, because elimination of WNK3's SPAK-binding motif, or catalytically inactive WNK3, prevents the activation of NKCC2. Based on these data, the investigators postulated WNK3 to be a chloride sensor. Recently, it was shown that NKCC2 phosphorylation also requires proper trafficking of SPAK by a trafficking protein called sorting protein-related receptor with A-type repeats (SORLA).37 SORLA is expressed in the TAL, and SORLA-deficient mice exhibit missorting of SPAK and an inability to phosphorylate NKCC2. The mice had a mild Bartter-like phenotype with lower BP, higher aldosterone, kaliuresis, and calciuresis, and an inability to conserve sodium during water deprivation (Table 2). Contraction of the extracellular fluid volume is a threat to survival, and as a consequence, mammalian kidneys conserve sodium avidly. Hyperkalemia is equally threatening, and as a consequence, kidneys can secrete potassium rapidly. The ability of kidneys to conserve sodium and excrete potassium may reflect dietary composition in Paleolithic times; during that period, diets were sodium deplete but potassium replete.41,42 Aldosterone plays a central role in renal control of both sodium chloride reabsorption and potassium secretion. 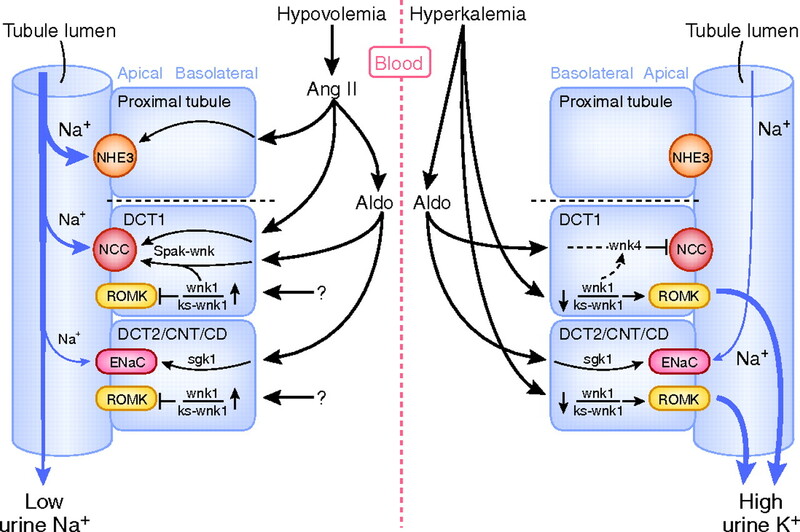 Indeed, major renal sodium and potassium transporters are regulated by aldosterone, including NCC,43 ENaC,44 and ROMK.45,46 However, the challenges of volume depletion and potassium overload are often dissociated, and aldosterone secretion is stimulated by either angiotensin II (in states of extracellular fluid volume depletion) or serum K+ concentration (in states of K+ excess; Figure 3). When aldosterone is secreted in response to angiotensin II, its primary effect is NaCl retentive; when it is stimulated in response to hyperkalemia, its primary effect is kaliuretic.47 The observation that aldosterone can serve distinct functions, depending on the secretory stimulus, has been termed the aldosterone paradox.42 Explanations hinge on the balance between NaCl transport and Na+/K+ exchange, but until recently, mechanisms have remained elusive. Model of the “aldosterone paradox.” Two pathophysiological settings are depicted: hypovolemia (left) and hyperkalemia (right). Aldosterone acts as a sodium retaining hormone during hypovolemia, leading to a low urinary Na+ excretion (left). Conversely, aldosterone acts as a K+-secreting hormone during hyperkalemia, leading to a high urinary K+ excretion (right). Hypovolemia stimulates angiotensin II (Ang II), which in turn increases aldosterone (Aldo). Both contribute to renal Na+ retention. Ang II stimulates Na+ transport in the proximal tubule by activating the NHE3. Ang II also increases the activity of the NCC in the early DCT1. Aldo activates both NCC and the ENaC in the late DCT (DCT2), CNT, and CD. Note that because Na+ transport is stimulated at three locations, the distal delivery of Na+ decreases, contributing to the low Na+ excretion. The effects of Ang II and Aldo are primarily mediated via a WNK–SPAK pathway, whereas the effects of Aldo on ENaC primarily involves SGK1. Unknown factors increase the WNK1–KS–WNK1 ratio, leading to inhibition of the ROMK, helping to conserve potassium during hypovolemia. In the setting of hyperkalemia, the opposite occurs, because direct effects of a high serum K+ level decrease the WNK1–KS-WNK1 ratio (right). This leads to an activation of ROMK, stimulating potassium secretion. The lower WNK1–KS-WNK1 ratio also increases WNK4, preventing Aldo from activating NCC (dashed line). However, Aldo is still capable of activating ENaC, which stimulates Na+ exchange for K+ in the collecting duct. The transporter-knockout models discussed above provide comparative information to analyze effects of regulatory proteins. Several mouse models have been generated in which proteins known to regulate NCC have been modified genetically, including WNK4, SPAK, and SGK1 (Table 2). SGK1-null mice do not recapitulate the effects of ENaC deletion but do exhibit hyperaldosteronism, mild hyperkalemia, and salt-sensitive hypotension because of reduced ENaC activity.60 Under baseline conditions, NCC abundance is normal, but when stressed with a low salt diet, NCC does not increase as much in SGK1 knockout as in wild type,61,62 providing evidence for an effect of SGK1 on NCC in vivo. Animals transgenic for wild-type WNK4 exhibit reduced abundance of NCC. The BP and urinary calcium excretion are low, compared with wild-type animals, and they have hypokalemia on low potassium diets,63 providing evidence that WNK4 exerts an inhibitory effect on NCC in vivo. Animals in which WNK4 has been deleted have not been reported, because it has been suggested that WNK4 deletion may be embryonic lethal.64 Instead, Ohta et al.64 generated WNK4 hypomorphic animals, by deleting one exon of the WNK4 gene outside the kinase domain. The animals exhibit salt-sensitive hypotension and a reduction in phosphorylated, but not total, NCC. SPAK and ROMK were unaltered, whereas the expression of all ENaC subunits was increased.64 The authors interpreted the results as indicating that wild-type WNK4 exhibits NCC-stimulating activity at baseline. This finding contrasts with the conclusions reached above, that WNK4 exhibits NCC-inhibiting activity.6,65 In view of the suggestion that it is the kinase activity of WNK4 that, through SPAK, stimulates NCC activity, it is unclear how deletion of a nonkinase WNK4 exon alters NCC activity; clearly, this is an area that requires further investigation. In summary, these in vivo studies showed that genetic inhibition of WNK4, SPAK, or SGK1 results in reduced NCC activity, leading to a reduced ability to retain sodium with hypotension, especially during salt depletion. The studies to date, however, are limited by the experimental approaches, leaving many questions unanswered. The model shown in Figure 2, derived largely from work in vitro, suggests that WNK1 mutations lead to FHHt by altering the KS-WNK1/WNK1 ratio, thereby affecting NCC. This led investigators to generate mice in which intron 1 of the WNK1 gene was deleted. Surprisingly, this deletion caused overexpression of both WNK1 and KS-WNK1 in the DCT and other renal segments, whereas KS-WNK1 was also overexpressed in other tissues.72 The phenotype of these mice has not been reported. The same group also generated KS-WNK1–null mice; these did show a two-fold increase in NCC expression, confirming that KS-WNK1 acts as a WNK kinase network inhibitor in vivo.73 However, neither systolic hypertension nor hyperkalemia was observed, again illustrating that additional effects are required for the development of the complete FHHt phenotype.73 Conversely, mice overexpressing the KS-WNK1 amino terminus display hypokalemia and increased ROMK abundance, as well as hypotension and a decrease in NCC abundance.74 These data provide strong support for the model, originally postulated by Subramanya et al.,75 that KS-WNK1 acts as a dominant-negative inhibitor of WNK1 in vivo (Figure 2). Besides the effects of angiotensin II and aldosterone, the effect of insulin on sodium reabsorption in the distal tubule is also becoming clearer.90 Hyperinsulinemia is a prominent feature of insulin resistance, diabetes mellitus, and obesity. Insulin receptors are expressed in the proximal tubule, DCT, and CD.90 Song et al.91 showed that the rise in BP in rats on chronic insulin treatment is likely caused by enhanced sodium reabsorption by NCC and ENaC, because treatment with hydrochlorothiazide and amiloride results in increased natriuresis. Interestingly, insulin also reduces renal cortical WNK4 expression, which contributes to activation of NCC and ENaC.91 NCC, the β-subunit of ENaC, and Na+-K+-ATPase also upregulate in the obese Zucker rat, a model of insulin resistance and obesity.92 More recently, the obese Zucker rat was shown to be more sensitive to thiazides than their lean counterparts, with a greater natriuresis, kaliuresis, and drop in BP on thiazides.93 Reduced renal cortical expression of WNK4 was also observed in this model. In addition to the possible regulation of NCC by insulin through WNK4, SGK1 is an established mediator of the effect of insulin on ENaC.13 Surprisingly, downregulation of insulin receptors also causes salt retention and hypertension, possibly through reduced renal nitric oxide production.94 Therefore, the contribution of insulin-induced anti-natriuresis relative to other anti-natriuretic factors in diabetes, such as higher plasma aldosterone levels, remains to be determined.95 Nevertheless, it is an interesting example of how the WNK kinase pathway may also play a role in acquired forms of hypertension. Insights derived from the discovery of WNK kinases and the elucidation of their renal effects represent a new paradigm for the molecular physiology of renal sodium, potassium, and BP regulation. Despite startling progress in understanding their roles, however, many questions remain, including the precise mechanisms by which they regulate protein trafficking and phosphorylation, the exact pathogenesis of FHHt, and the role of WNKs in the development of hypertension. The current models, such as that shown in Figure 2, must be placed in the perspective of the methods used to obtain the data, which have often relied on cell systems. Although important, these studies should be complemented with physiologic studies in whole animals and genetic epidemiologic approaches in humans to establish an integrated model of this complex kinase network in health and disease. E.J.H. is supported by an Erasmus MC Fellowship 2008 (internal grant) and a Kolff Junior Postdoctoral grant (Dutch Kidney Foundation KJPB 08.004). DHE is supported by NIH R01 DK51496, by the Department of Veterans Affairs (merit Review) and by the American Heart Association. : Over-expression of the sodium chloride cotransporter (NCC) is not sufficient to cause familial hyperkalemic hypertension. : Decreased ENaC expression compensates the increased NCC activity following inactivation of the kidney-specific isoform of WNK1 and prevents hypertension. Proc Natl Acad Sci USA 107: 18109–18114, 2010.